Luna Park has impressively transformed some of New York's most recognizable landmarks into amusement park rides. Well, at least in this video. 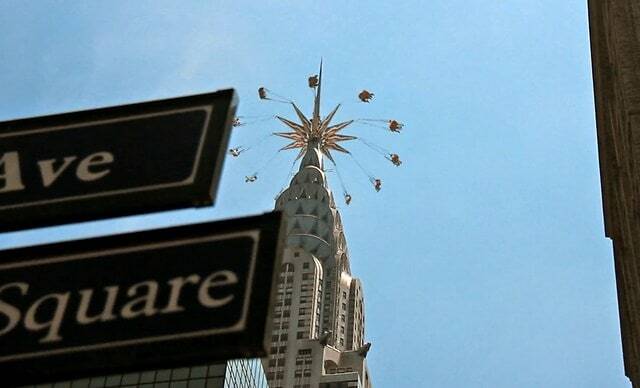 The top of the Chrysler Building hosts the world's tallest carnival swing ride, Times Square is the home of a tilt-a-whirl car, and a superman roller coaster zooms past the Empire State Building. Although it's safe to say that this amusement park won't be a reality anytime soon, the special effects are stunning. Fernando Livschitz utilizes tilt shift photography, and impressive computer generated imagery to transform NYC into a theme park. Livschitz, an Argentinian director, began pumping out award winning work at age 17. He specializes in altering light and color, to illuminate cities like never before. Check out his website to see other major cities digitally converted into carnivals.